Interesting how much is foreign to U.S.: lattice biscuits and custard powder. But as you say on Facebook, one can google and find equivalents. At any rate, it looks very good! Traditionally you would make this with puff pastry instead of the biscuits. Might try that next time! I'd love this if only I could get passionfruit pulp, custard powder, etc. But we live in a different world. It's funny what we think is commonplace but it really isn't in other places. Heeeeeellllllllloooooooo!!! Glad to have caught up! (Actually I saw news of your trips on Facebook!). This sounds so good and I'm so happy you posted it. I'm sure I can find US equivalents for everything, and I too am not a passionfruit fan. This dish is new to me but now I'm eager to make and taste it. I'll skip the passion fruit too. I like the sound of a lemony icing. I have thought about trying a lemony icing. Maybe next time. This sounds delicious! I've had similar desserts but I don't think I've even really thought about making it. I definitely agree that there is a huge difference between bad custards and good custards but there's not much better than a good custard! I don't think we have the biscuits you mention here in the US but I know my grocery store sells custard powder and I saw where you mentioned puff pastry can be used as a substitute. I'll definitely be giving this a try though I think I'll probably leave off the passion fruit glaze as well. I don't know why I hadn't thought about making it before either. "...amazing vanilla slices, also known colloquially as 'snot blocks'..." :) A revolting term, and one I have never heard before. But it is exactly what I thought of them man years ago as a small kid when my Grandma used to make them. Didn't stop me finding them absolutely delicious! It does sound disgusting to call it snot block but it is tasty!! 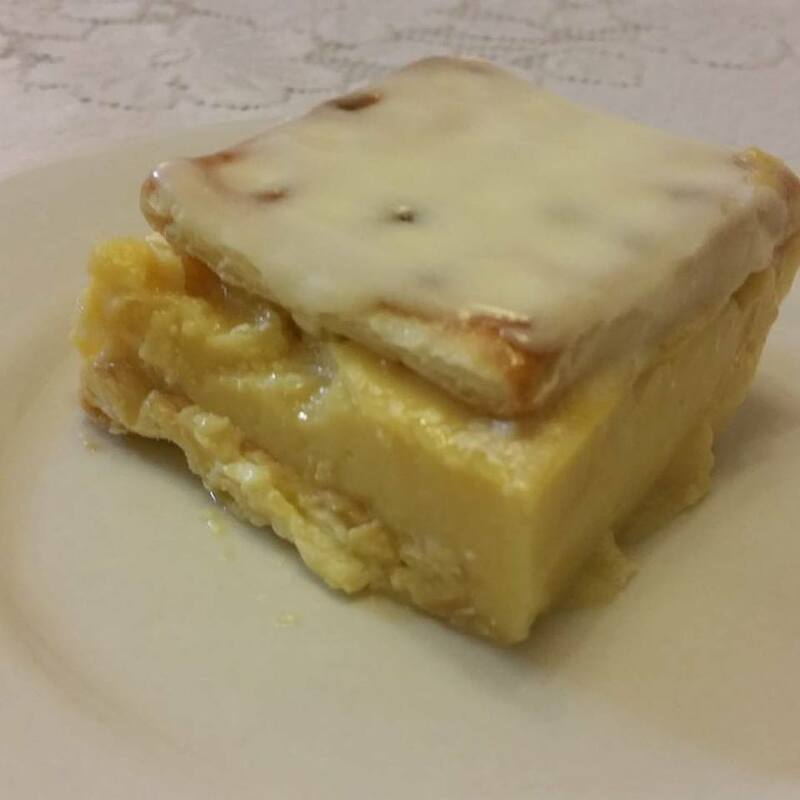 Hope you had a custard square and you enjoyed it!! Ha! I love your re-entry into blogging. Making the same recipe three times in a week? It must be good! It is!! NOt sure when I will make it again now, but soon. 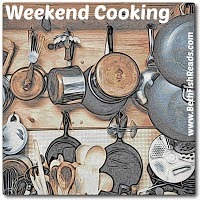 Welcome back to Weekend Cooking and the blogosphere! Love your sense of humor about catching us up. I just made gluten-free pastry cream (or creme patisserie, as we always called it from the Joy Of Cooking recipe) for Boston Cream Pie and at first I thought it didn't thicken enough, but it was perfect for the layer cake (just ignore the word Pie in the name of this cake) and I was pleased with myself, too! Custard and I sometimes don't get along in the kitchen. I haven't ventured into sugarfree dessert baking yet, but your slice looks good! I was very very pleased with myself. I am a passionfruit fan so this recipe appeals to me. I always have a relatively thick passion fruit syrup, which would make a perfect glaze. We have tons of the fruit, and love it, raw or cooked. Don't know about the custard, will have to find an equivalent for that powder. Oh that sounds different! I think I would go with a regular icing/glaze too! I love anything with passionfruit. when I was in France many of the desserts where passionfruit flavored.